Season the steaks with the fajita seasoning. Heat a grill pan or a sauté pan and sear steaks well on each side. Cook steaks until they are done as you like and set aside while you sauté the vegetables. Mix the ranch dressing, bacon and cheddar cheese together in a bowl. 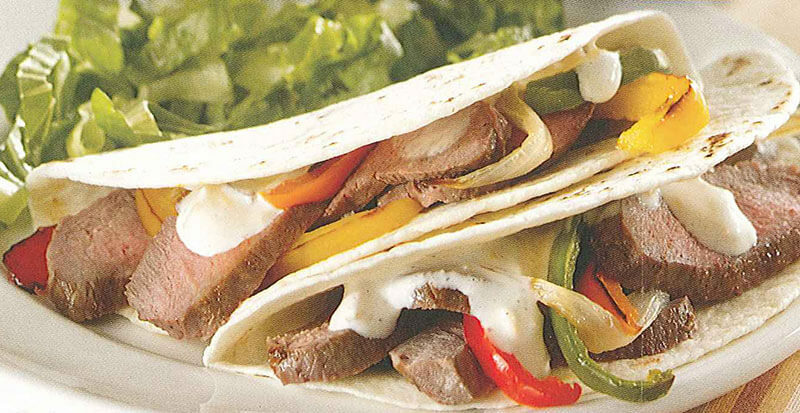 Slice the steak into thin slices and serve with warmed tortillas and the bacon cheddar ranch sauce. Make a steak fajita salad by skipping the tortillas, and topping crisp shredded lettuce with steak slices. Drizzle with the Ranch dressing and serve with tortilla chips.